My flamenco Guitar is based on a Marcelo Barbero from 1952. I had the opportunity to examine this original and magnificent Barbero in my workshop ,which immediately impressed me completely, to take all the necessary measurements for a replica. The positive feedback on this replica was so far-reaching that I threw the previous concepts overboard and adopted this Barbero model with a few changes. First and foremost, my flamenco guitar is build very light and thin, as it was known from early and mid-20th century traditionally spanish guitars. 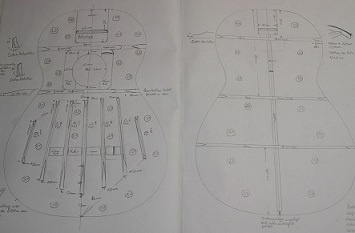 With a stiffer frame construction, however, I receive a more powefull and balanced guitar. The top construction with its typical Barbero the bridge plate provides a nice balance between response and sustain and is therefore very well suited for fast as well as slow played passages. As a finish, I am using only french polish for the entire instrument, which is applied by hand in the traditional technique. French polish has considerable advantages compared to other finishes. It leaves only a very thin, protective layer on the guitar due to the method of application, which allows a wider range of vibration for the top. In this way the instruments gains more volume and sonority compared to artificial lacquers. Shellac also has the advantage that it is reversible and very easy to maintain.